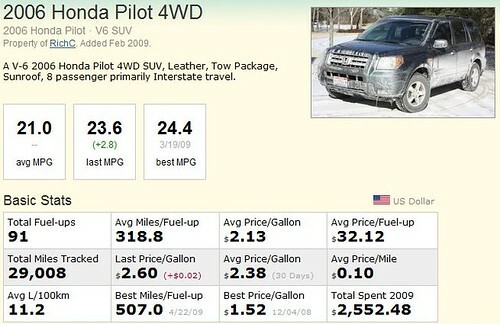 I’ve been happy with the overall cost of ownership of my 2006 Honda Pilot SUV … including the fuel efficiency. Besides oil and fluid changes, the only other expense of ownership over the past 87,000 miles to date has been a battery and of course gasoline. After posting my latest fill-up to Fuelly.com, I was please to see that overall mileage was 21.0 MPG, which isn’t too bad for an 8-passenger 4-wheel drive vehicle. I would have preferred a diesel, but I doubt it would have been as cost competitive as the Honda (besides diesel prices have stayed a bit higher than regular unleaded gasoline for several years). For those needing or wanting a comfortable, relatively efficient and reliable 4WD eight passenger SUV, I think you’d be hard pressed to find one that has the track record of the Honda Pilot.